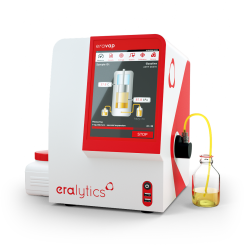 ERAVAP is the ultimate vapor pressure tester for all types of liquids, from gasoline to LPG, as well as crude oil, solvents, fragrances and polymers. Its piston based measuring principle performs tests in full compliance with the latest standards. With its integrated quality control mode, unmatched precision, stability, and measuring range it is the ideal solution for routine measurements in laboratories or in the field, as well as for R&D applications. The measurement principle used for the ERAVAP vapor pressure tester series does not need an external vacuum pump. Instead the so-called mini method uses the built-in piston to introduce the sample. 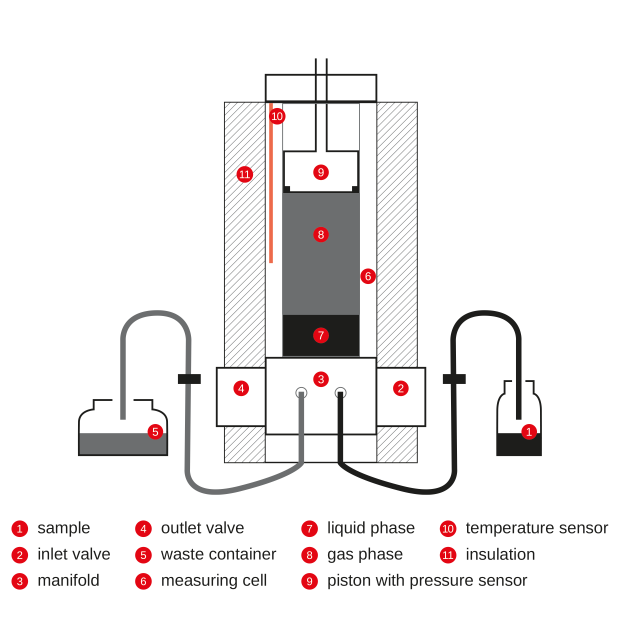 The sample is then heated to the measurement temperature and the piston expands the headspace of the measurement cell to the desired vapor-liquid (V/L) ratio. The most commonly used mini method, ASTM D5191, measures a cooled and manually air-saturated sample with a single expansion step. In contrast ASTM D6378 uses a triple expansion on a sample to expand it in three steps to the final V/L-ratio. The recorded pressures at these three steps are used to calculate the contribution of dissolved gases to the vapor pressure of the liquid. 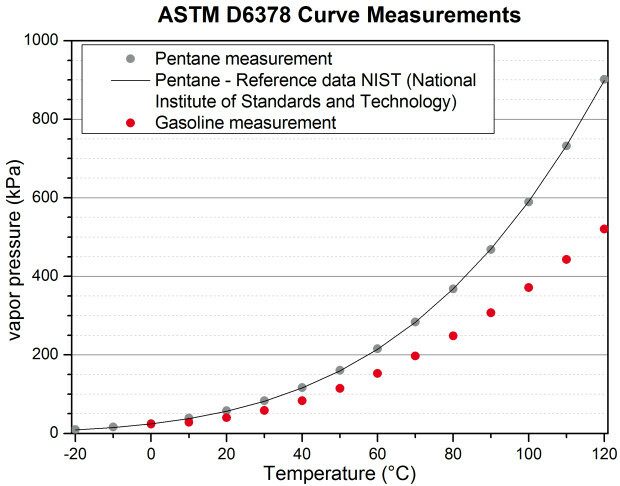 ASTM D6378 therefore gives the absolute vapor pressure of the liquid as the result where as ASTM D5191 outputs sum of the absolute vapor pressure and dissolved gases called total vapor pressure. This removes any operator bias caused by errors during the air saturation step. 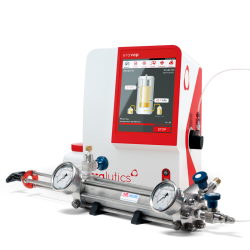 To make eralytics’ vapor pressure testers even better a quality control (QC) mode is right on the instrument. It allows to monitor various QC samples in parallel. Quality assurance measurements are performed in full compliance with ASTM D6299. This improvement makes it even easier to continuously verify the ERAVAP’s high performance. To perform efficient quality control, the user can set individual warning levels to each QC sample. If a sample is measured and the results falls outside these limits a warning is automatically displayed. Additionally, QC charts are available to easily identify long term drifts and perform statistical evaluations of results. The Peltier elements used in the ERAVAP vapor pressure tester series allow an unmatched temperature range from -20 °C to 120 °C (4 °F to 248 °F) and a pressure range from 0 kPa to 1000 kPa or 2000 kPa, respectively. In addition the V/L-ratio can be adjusted within a range of 0.02/1 to 100/1 to adapt the ERAVAP to all kinds of measurement needs. The use of a self lubricating piston and other state of the art equipment combines excellent performance with simple use and minimum maintenance. 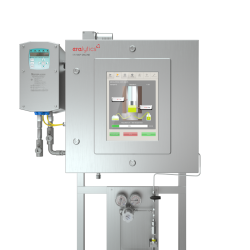 Additionally the ERAVAP vapor pressure tester outperforms the standard methods (ASTM D5191 and D6378) in terms of repeatability and reproducibility (r = 0.3 kPa, R = 0.7 kPa) for the entire operating range.